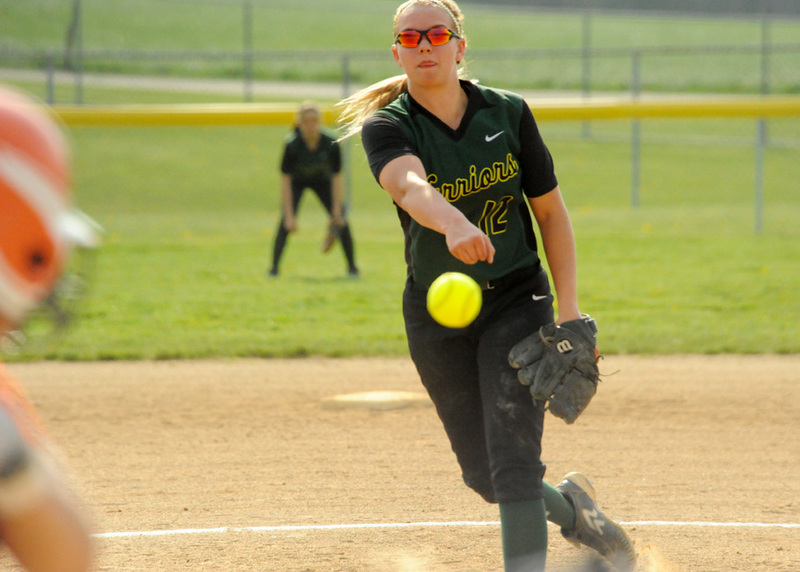 SYRACUSE – Wawasee’s softball team sure isn’t playing like a bunch of underclassmen. Riding the arm of freshman Meghan Fretz and using the key contributions of several others, Wawasee held on for a 4-2 win against visiting Warsaw Wednesday afternoon. Fretz, who has now pitched in six games in just over two weeks after not pitching in the first 10 games of the season, was dealing bullets. The freshman fireballer struck out seven but made her hay getting out of trouble early in the game. A walk, a single and an error loaded the bases with just one out in the first as Warsaw were in business. But Fretz got an infield fly and then a strikeout to end the threat. Two innings later, Karly Jones singled and stole second and third with just one out, but Warsaw again could not get the ball out of the infield and left Jones at third. Warsaw would take a 1-0 lead in the second inning when Ashley Ousley ripped a solid single, driving in Kalie Keener. Wawasee responded with single runs in the third and fifth innings. Sophomore Danielle Gunkel drew a bases loaded walk to tie the game and classmate Cristina DeLaFuente drove in a run with a single. The Lady Warriors tacked on two insurance runs in the sixth when Alli Ousley tripled off the fence in deep center, driving in a run and later scored on a wild pitch. That really was about all Wawasee would muster on Warsaw pitcher Kaleigh Speicher, who allowed just five hits and did walk six, but otherwise kept the damage to a minimum. Speicher added a homer in the seventh to straightaway center to slice the lead in half, making the Ousley output in the sixth big runs for a Wawasee team that couldn’t catch a break the first time the two teams met in a 3-1 Warsaw win. Speicher, Jones and Ousley, who combined for all six of Warsaw’s hits in the first meeting between the two teams, also had all four of Warsaw’s hits Wednesday. Gunkel led Wawasee with two hits and the run-scoring walk. Warsaw falls to 5-10 overall and 4-4 in the Northern Lakes Conference with the loss while Wawasee improves to 12-6 and 4-4. Warsaw will travel to Goshen Friday while Wawasee will visit Elkhart Memorial, also Friday evening. Wawasee’s JV started hot and ended hot in a 10-0 win against Warsaw. The Lady Warriors scored three runs in the bottom of the first and then closed the game scoring three in the fifth and three in the sixth to end it. Wawasee also outhit Warsaw 10-3 to move its season record to 14-0. The combination of Hannah Haines and Kayla White were dynamite in the circle with Haines striking out 12 in five innings, White getting one whiff in an inning of relief. Haines added three hits at the plate and scored three runs while White had a triple. Nicole Streby and Leah deSomer added two hits each to assist in the attack. Warsaw’s Ashley Ousley connects on an RBI single in the second inning against Wawasee. Wawasee second baseman Danielle Gunkel hauls in a fly ball during the first inning against Warsaw. Kaleigh Speicher of Warsaw connects against Wawasee. Warsaw’s Kaitlyn Williams motors toward home plate eventually scoring the first run of the game against Wawasee. Wawasee’s Ale Brito makes contact against Warsaw.